When it first became widely available, e-mail quickly established itself as the ultimate killer app. After decades of helping people communicate with the speed of a phone call and the permanence of a letter, it's still the most mission-critical tool in many organizations. As with any mission-critical app, there are several essential factors. Reliability is crucial. Nothing will cause a company-wide panic faster than your e-mail system going down. Your customers must also have a strong e-mail security infrastructure, not only to maintain that high level of reliability, but also to combat viruses, spam and spyware. That unwelcome traffic is still a major hindrance to efficiency and security. As use of e-mail increases and organizations diversify, expand and do business across the globe, scalability becomes increasingly important as well. Microsoft has clearly answered those challenges with Exchange Server 2007. The latest version of its flagship e-mail platform is a major upgrade to the previous version, Exchange 2003. There are two versions of Exchange 2007: Standard and Enterprise. It's important to understand the differences between the two in order to give your customers the solution that will work best for them. Much like the equivalent versions of Windows Server 2003, the Standard version of Exchange 2007 is more suitable for medium-sized environments (or small ones if they have 64-bit servers). The Enterprise version is for larger companies with hundreds or thousands of users spread across multiple locations. The primary functional differences between the two versions are storage group support and database support. The Standard version can handle up to five storage groups and five databases, while the Enterprise version can handle up to 50 of each. As you may expect, that additional capability doesn't come for free. The Standard edition is $699 per server, while Enterprise is $3,999 per server. A Client Access License (CAL) for Standard is $67. The Enterprise CAL (which also includes Software Assurance) is an additional $36. The first thing to note about Exchange 2007, and one thing you'll want to ensure your customers understand completely, is that it's a 64-bit product. There isn't a separate 64-bit version. Exchange 2007 is 64-bit only. Customers wanting to run Exchange 2007 on 32-bit servers are flat out of luck-end of story. The main reason Microsoft scrapped the 32-bit version, which actually was available during the beta testing phase, is memory-addressing space. This became a crucial issue as Microsoft packed more functionality into Exchange. The maximum amount of RAM that a 32-bit operating system can access is 4GB. The new 64-bit architectures can access 16GB of RAM. Exchange 2007 supports processors using Intel Extended Memory 64 Technology (Intel EM64T) and AMD64. That short list rules out the Intel Itanium (IA64) processor, which is an important exception to keep in mind. Get your customers to give you the full details of the hardware upon which they plan to run Exchange. That doesn't mean, however, that you need all 64-bit desktops connected to your servers. Exchange 2007's management tools will work with a standard 32-bit system running Windows XP SP2. Windows Server 2003 first introduced the concept of server roles. The idea with server roles, for example, is that if a server will be a Web server, it won't need all the complexity of a domain controller. Thus, your customers can install each server with just the functionality it needs, simplifying their environments and lowering total cost of ownership. 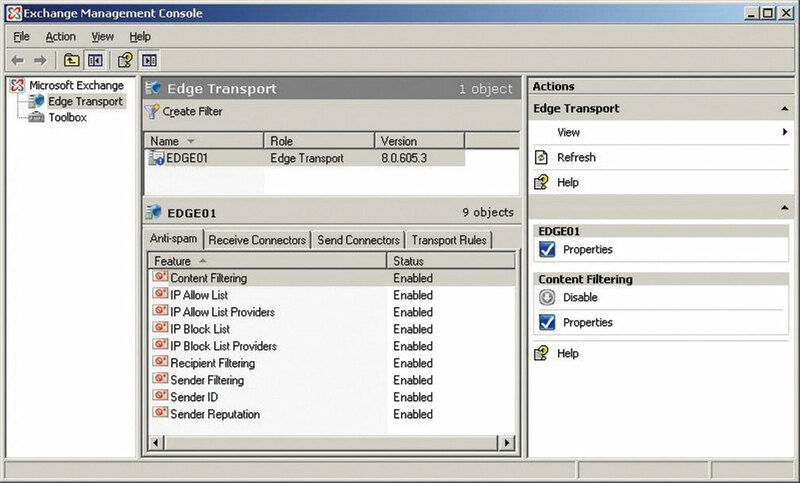 Edge Transport: An edge transport server is the guardian watching inbound mail coming via the Internet or outbound mail going over the Internet. It provides mail quarantine, as well as anti-spam and anti-virus protection. Hub Transport: The hub transport acts as your Exchange post office, routing e-mail to the appropriate mailboxes. There must be a hub transport installed on every Exchange server. Mailbox: The mailbox is where the data is ultimately stored. Like the Hub Transport, it's required on every Exchange server. Client Access: This role is primarily for servers providing access to mobile clients through Outlook Web Access (OWA), POP3, IMAP and Web services. 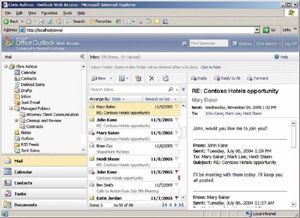 Unified Messaging: Exchange 2007 can handle voice mail and faxes, as well as e-mail messages. This eliminates the need for separate voice, fax and e-mail messaging systems. Those last two items point out one of the major upgrades to Exchange 2007. It can now deliver e-mail-and more-to any device at any time. Mobile messaging is more critical than ever, and Exchange 2007 has substantially improved its functionality in this area. Probably the most important part of remote e-mail access is OWA. Over the years, Microsoft has steadily improved OWA to give it more of the look, feel and functionality of the standard desktop version of Outlook. 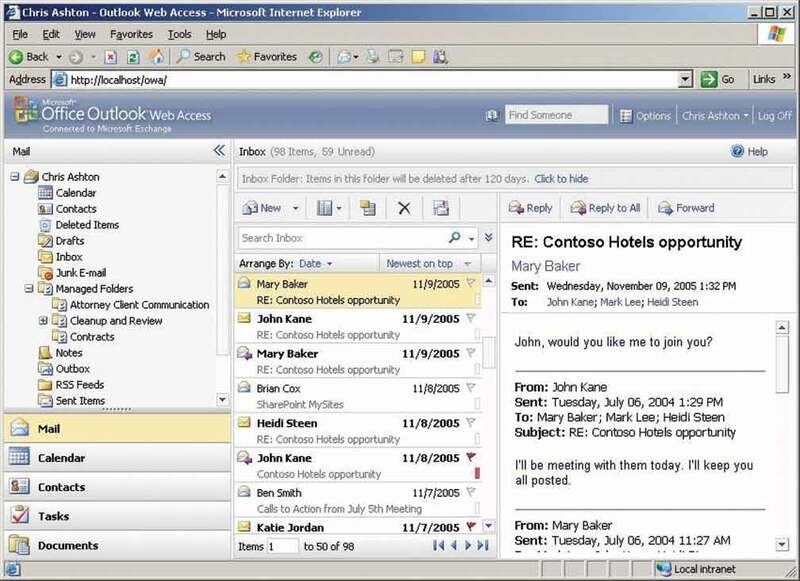 The new OWA is also nearly identical to Outlook 2007 in appearance, making it easier to use. OWA 2007 has a number of upgrades that your customers have probably been clamoring for, including the ability to schedule "Out of Office" messages, search the Global Address List, access RSS subscriptions and book meetings with the Scheduling Assistant. For users operating over slower connections, there's a smaller footprint version called OWA Light. A new feature in Outlook that bears mentioning here is AutoConnect, which uses both Outlook 2007 and Exchange 2007. To set up e-mail in a previous version of Exchange, your customers would need to know which type of server to connect to, the server's name and where it's located, and then step through a lengthy process to get connected. With AutoConnect, a user simply enters a username, password and e-mail address. Exchange and Outlook set up everything else. Your customers and their users alike will appreciate the user-friendliness of AutoConnect. One of the biggest leaps forward in Exchange 2007 is Unified Messaging. With Unified Messaging, your customers' voice mail messages and fax messages are stored right along with their e-mail messages in Outlook. Those other types of messages can also be handled just like e-mail. A user could forward a voice mail message to another co-worker, for example. The flip side of that capability is that your customers can access their Exchange 2007 environments through a regular telephone. Because Exchange 2007 includes speech recognition, they can also have their e-mail messages, calendar items, contact information and so on read to them through text-to-speech conversion. Experienced admins know that scripting is a faster and more efficient way to manage their servers than going through a graphical user interface (GUI). With Exchange 2007, those admins will finally get their wish, as every management task can be scripted through the new Exchange Management Shell (EMS). For those admins with command-line phobia, Microsoft offers the Exchange Management Console (EMC), the front-end of the EMS. Wizards in the EMC display the command-line syntax for each action an administrator attempts, helping them get up to speed quickly and enabling them to learn scripting on the fly. Then, they can automate many of the tasks that now require a tedious GUI to perform. There are several serious competitors to Exchange 2007. They include Lotus Domino 7.0.2, Novell GroupWise 7 and open source Open-Xchange Server 5. Lotus Domino Messaging Server. The basic server for business e-mail, calendar and scheduling. Lotus Domino Enterprise Server. The closest equivalent to Exchange 2007-it includes the messaging server plus a platform on which to run custom or vendor applications. Lotus Domino Express. Suitable for smaller companies with 1,000 or fewer employees, according to IBM. Domino has e-mail, calendar and scheduling functions, clustering and failover support, and built-in admin and systems management tools. The pricing structure for Domino starts at $38.50 per CAL and goes up to $104 for Lotus Notes for Messaging (that price includes the client software and CAL). Pricing for Novell Inc.'s GroupWise is a bit more straightforward, but there are a multitude of options. The base price is $130 for the product and a one-user license. The version that includes Mobile Server is $163 for a single-user license. GroupWise includes e-mail, instant messaging, a Web client called WebAccess, a calendar, PDA synchronization and more. Open-Xchange Server 5 is a Linux-based messaging/collaboration platform. There are two versions: a free "community" version, and a commercial version. The community version is so stripped down that it can't possibly compete with Exchange 2007, as it lacks essentials like installation tools, standard support, manuals, Web-based administration and so on. Because it's currently a 32-bit only product, it will likely fall short of the performance and scalability marks of a 64-bit program. Open-Xchange is $1,095 for one server license and 25 user licenses. It includes all the essentials of e-mail, calendar and address/contact book. With a product as important to its bottom line as Exchange, you would expect Microsoft to have a deluge of sales and marketing information. Redmond doesn't let you down here. There's a "Top 10 Reasons to Upgrade" article on its Exchange Web site that will answer many of the questions your sales team will hear from potential customers. This is a good place to start any sales presentations to potential customers. Exchange 2007 even has its own "Online Concierge." This 24-hour service -- available on the partner Web site -- lets you chat one-on-one with an Exchange expert. But think of them more as research assistants, as they don't have the answers right off the top of their heads. Your concierge will be a repository of help in locating whatever resources you might need. The Unified Messaging technologies in Exchange 2007 are a powerful reason to switch or upgrade, but it's fairly high-end, conceptual technology-not the easiest thing to sell. To help with those types of presentations, Microsoft has released the "Exchange Server 2007 Unified Messaging Sales Kit" (also available on the partner Web site). This will give you some guidance on how to position Unified Messaging to your customers, as well as details on how to implement the technology. There's also a more general sales and marketing guide available under the Sales and Marketing tab on the partner portal. While this one isn't specific to Exchange 2007, it gives advice and strategies that you can fine-tune for any Microsoft product you sell. Exchange 2007 is a significant upgrade over Exchange Server 2003. Its 64-bit nature means it will be a lot faster and more scalable than previous versions of Exchange. Unified Messaging seems to be the future of message management. Its integration into the core product is a big step forward. Exchange 2007 is also much more mobile-workforce-friendly. Microsoft's competitors in this space appear to be lagging behind, giving Microsoft and its channel partners a strong opportunity to increase market share in this space. It's not a revolution over the previous version, but it's a large enough evolution that enterprises should seriously consider an upgrade or new installation with a 64-bit hardware upgrade.